Since I posted a few weeks ago about my new Ultimate Direction Fast Draw Extreme Held Water Bottle that I’ve been using on my runs I thought I’d also share with you my new Pacifica Pitcher I received from Brita who is sponsoring the 2011 BMO Vancouver Marathon (this Sunday, May 1st!!!) I really like to use only water on my runs and not use sports drinks since I’m already using energy chews which have carbohydrates in them and I don’t need to add to the calorie and sugar consumption. I find water much more refreshing when I’m running than I find sports drink, especially on my long runs. Sometimes when I’m really thirsty on my long runs I just want something that’s refreshing and doesn’t have a sugary syrupy texture and water really cools me down as well as quenches my thirst. I have to admit I really used to poo-poo running with water since I prefer to be as unencumbered as possible but I started noticing when I would get thirsty on runs it would lead to headaches later and it would take me much longer to rehydrate after a run then when I drink water before, during and after. On my longer runs if I didn’t get enough water to drink it would sometimes take me up to 3 days to get back to my normal thirst level. I noticed having dry mouth and lips and also the amount of fluid I consumed in the following days was much more then my regular amount. Since I started really taking care to drink the right amount of water before during and after I’ve noticed those symptoms of dehydration disappeared but also my recovery from my runs is much better. The Lululemon Manifesto states ‘Drink fresh water and as much as you can. Water flushes unwanted toxins from your body and keeps your brain sharp’. The last part is so true. My husband is currently recovering from a violent bout of the stomach flu in which he became so dehydrated that he started having a very altered mental state and was acting confused and disoriented and ended up fainting on me so we rushed him to the hospital where he received an IV drip. He’s now almost totally better but he’s still quite thirsty and so he’s been hogging all of my Brita filtered water from my pitcher and I’ve been relying on my Brita Faucet Mount System that Brita also sent to me to test out on my preparation for my big run. I really like filling up my handheld water bottle and ice cube trays with my Brita Faucet Mount Filtration System and keeping my 10 cup water pitcher (Pacifica) nice and full in the fridge for my pre and post run drinks. It’s really great coming home from a long run and having my water already refridgerator chilled instead of having to run the tap water for a few minutes. As a mom runner my running time is quite limited so I have to work my shower into my ‘run time’ and standing at the sink waists valuable ‘me’ time. You would be appalled to know how brief my stretching time is after my run but I haven’t had an injury so far so I count myself lucky on that one. An interesting thing I learned was that Brita is coming back to the 2011 BMO Vancouver Marathon and is filtering 30,000 litres of water along the rout for us thirsty runners. By doing this Brita is keeping 60,000 water bottles (typically whats used at water stations) from potentially entering the landfills. Brita is also using paper-based biodegradable cups too so that there is practically zero waste – talk about a great idea! 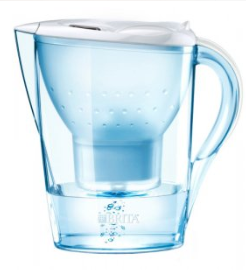 As a thank you to my readers that have provided me with excellent tips in your comments in my How It’s Going: Half Marathon Training Posts Brita and I would like to offer one reader a chance to win a Brita Grand Pitcher (pink in color). All you are required to enter is to be a participant of the BMO Vancouver Marathon and to leave me a comment in this post with your email address telling me how you hydrate for your runs. The winner will be notified on Thursday, April 28th by email. "Lululemon Ad In Runner’s World Magazine"